Oblong Industries invited visitors to InfoComm 2018 to experience workflows with Mezzanine. By combining Mezzanine with collaboration products such as Cisco Webex Teams, co-workers can move between the desktop workstream of a Webex Teams environment to a multi-user, multi-location, multi-stream Mezzanine meeting space with ease. Mezzanine meetings are easily triggered in Webex Teams, creating a link between the Webex Teams space and Mezzanine. Any assets shared in either space are synchronised immediately so teams can easily access and use content that is shared after the meeting ends. “In almost every business vertical, there is a need to escalate discussions into full fledged meetings and gather stakeholders around critical information for decision-making,” says Oblong’s vice president of business development Steve Vobbe. 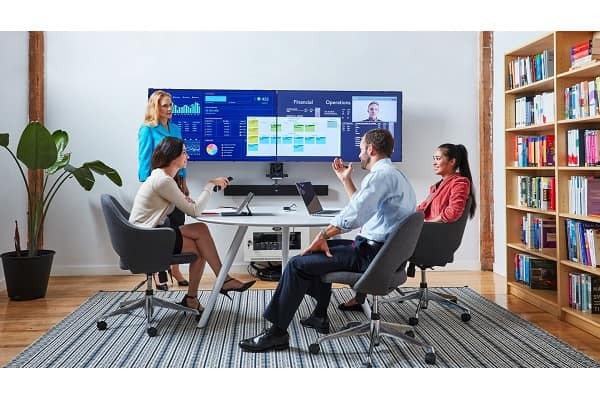 “We’re making it easier for our customers to understand it’s not Cisco solutions OR Oblong solutions, it’s Cisco PLUS Oblong to create the most productive and collaborative work environment,” says Cisco Webex head of global business development Justin Ramirez. Mezzanine scales up to large architectural spaces with the Mezzanine 600 Series, and down to conference rooms and huddle spaces with the Mezzanine 200 Series. Collaborators in all Mezzanine-enabled workplace settings can see and control all the content and data streams that are essential to the task at hand.